First of all, I hope everyone had a very happy thanksgiving that involved a lot of good food and time with the people you love! Second of all, I wanted to take a moment from my busy Sunday night to pause and give thanks. For some reason, I always manage to bring piles of work home on the weekend and it ends up untouched until very late on a Sunday night! I knew I could brush off my blogging for another day, but I felt that I should post. We are still looking for more guest bloggers! Leave us a comment if you are interested. I love being a guest! 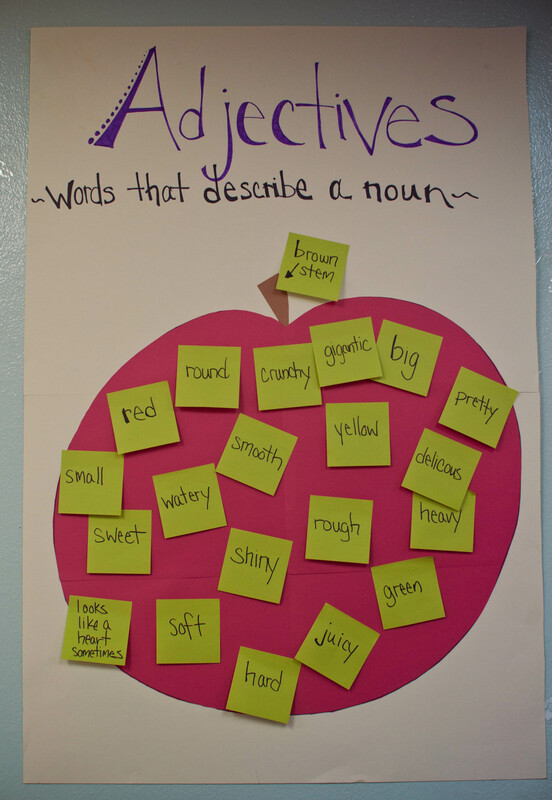 I was on Pinterest again a couple of weeks ago (I mean I am on it almost every day, but that is besides the point) and I came across this fantastic lesson on adjectives by Jennifer over at Rowdy in First Grade. For her lesson she uses a giant pumpkin because it was Fall and close to Halloween. Well, in Korea there aren’t a whole lot of pumpkins (pumpkin carving doesn’t really exist here), so I decided to do this same lesson with an apple instead. It worked out really well! Once we had all of our adjectives we took a simple, “boring” sentences, and we added in our adjectives! Then the students took turns writing their own sentences about a pet they have, or want. The kids loved it, even my kindergarteners were able to give some great sentences. What kind of noun would you use for this kind of activity? Do you have a great adjective activity you like to use? TELL US through comments : ), yes we will keep asking for them! 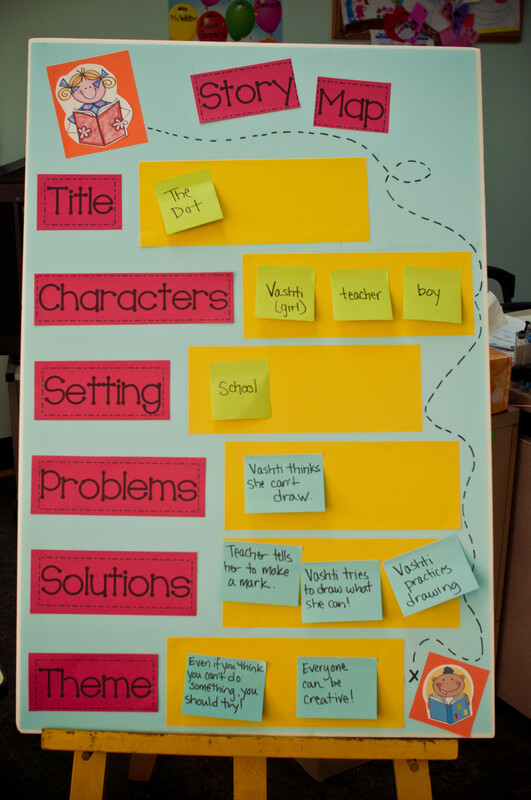 Need a great Story Map? Look no further! Pinterest brought me to this post on Growing Kinders, and Kathleen got this idea from Kim Adsit’s website. I just love sharing! The great, great thing about this poster is that you can use it again, and again— I love visuals. I love this! We read this book last week right before I did an art project with my little ones. 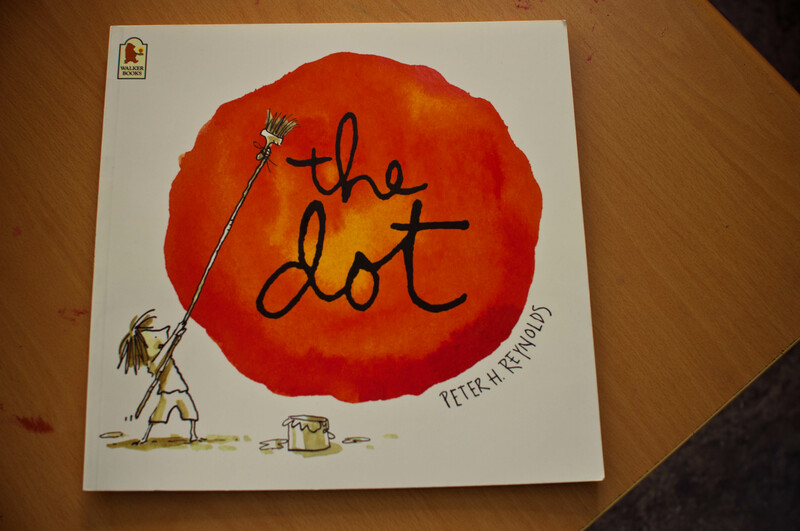 If you have never read The Dot, I highly recommend it! Imagine being part of a team of 13 talented teachers, with years of experience in different grade levels and subject areas. Imagine being part of a team that meets weekly, collaborates, shares ideas and resources, looks at student work and delegates effectively the million and one things we need to get done. At first, I had no idea what to expect. I couldn’t really imagine how a team so big could function effectively together. All the schools I’ve worked at before, I had been part of small grade level teams. I was one out of two fifth grade teachers last year. This year, I am one of 13 fifth grade teachers in my school. We have 22 students in each class. If you do the math, that is 286 students in one grade level. I love that all of our classrooms are all the same floor and we are a few steps away from our colleagues classrooms. I love that I can walk into any of the classrooms and have colleagues that are excited to share with me the work they do. I love that I’m growing so much as a teacher by being part of this team. I love that we are passionate about what we do. After four months of being part of this team, I can confidently say that we are a dream team. We work hard, we collaborate, we push each other to become better at our profession, and we have fun. As thanksgiving is around the corner, I know that one of the things I’m incredibly thankful for is our dream team of fifth grade teachers, making a difference in the lives of our students, one day at a time. I love that we cannot teach the way we were taught to teach (or the way we were taught) because education is constantly changing. The way we teach now is not the way my parents were taught, or I was taught. My parents were educated to be part of a world where things had yet to exist (the internet, cell phones, 3D movies! ), and I was educated to be a part of a world where things did not exist (wi-fi, tablets/kindles, smartphones, 4D/Imax! ), so are we educating the youth to be a part of the future world (can you imagine the things that have yet to be invented?). One thing I hope never ceases to exists are real books, and putting a pen to paper. There is something about holding a book, smelling the ink on the pages, and getting lost in a story that you just can’t get with an electronic device (don’t get me wrong, I loved my kindle— before it broke/I broke it— it was so convenient). I have heard that teaching cursive (even handwriting) is a lost art now, no one hand writes anything anymore, it’s all typed. LIES. I write every day, haha. 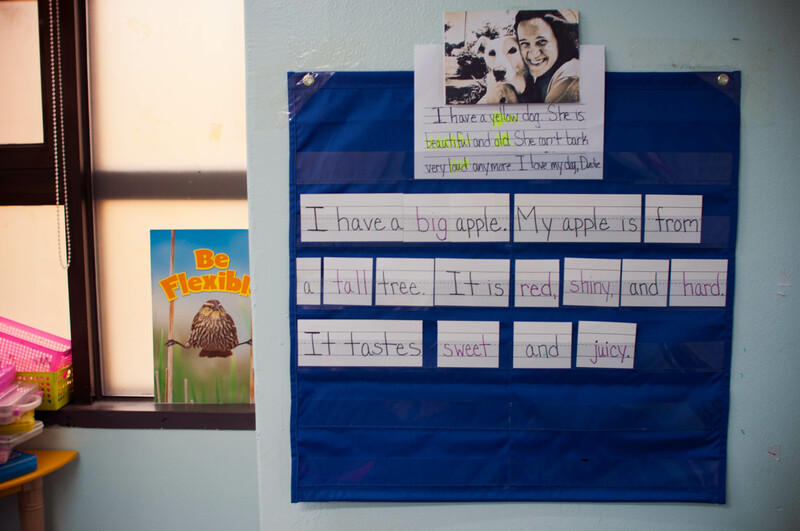 Teaching Kindergarten is new for me (did you know? have I mentioned that yet?! ), and one of the joys I have found this year is watching students discover books for the first time. When they pick up one of those small, simple books, and can read the words from the beginning to the end for the first time without your help— their smiles are infectious, the joy is actually contagious. Would it be the same if they learned those words on a screen and flipped pages on a tablet? I don’t know. Will hard books cease to exist? What do you think? What is something you hope will never leave the education world? Imagine being the teacher of over 1000 students all in the same class. Yes, it sounds a bit crazy. Yet, it’s possible today in the technology driven world. Melody and I have started taking this FREE online class from Stanford University, more of a learning experiment on my end. It’s called designing a new learning environment. I blogged about it here. At first, I was intrigued by the idea of offering “free” education. You know that economic theory how they say there’s no such thing as a “free lunch”. Well, I wanted to see what a free online class from Stanford would be like. The hardest thing so far is keeping on top of my deadlines for assignments! They don’t really send us reminders about assignments, so you need to be on top of it. Well, this class is obviously not my number one priority right now, and I’ve found myself in a panic when I realize my assignment is due in the next 17 hours. Good thing I’m in a different time zone, it helps me a little bit. So far, the time commitment has been reasonable and I’ve been reflecting and learning already. There are short video clips of lectures we watch, weekly assignments, and a final group project. It has been interesting seeing how this whole online class thing works. It’s weird not really being graded and assessed on every assignment especially by the teacher. Our assignment we just submitted will be “graded” by my peers. I’m think of posting some of my assignments as a blog post as well. 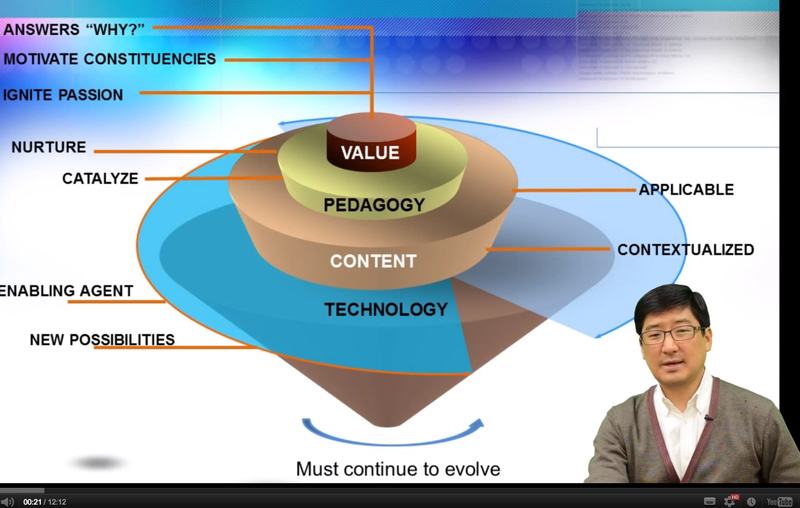 I wonder if this is the direction education will take in the future, where there’s no physical classroom, but being connected to your teacher and classmates through the Internet and various technology driven learning platforms. I’m not sure if I’m ready to let go of my notebooks and pencils. I’m not sure if I’m ready to let go of giving my students high fives. I’m not sure if I’m ready for the change that will come. Have you taken any online classes before? If so, what has that experience been like? A snapshot of our video lecture!